As promised, here is a sneak peek from WICKED BITE, book two in the new Night Rebel series featuring Ian and Veritas. This sneak peek consists of the prologue, Chapter One and Chapter Two. Before we get to it, however, HUGE SPOILER WARNING: If you haven’t read SHADES OF WICKED (book one) yet and you read the below, you WILL get spoiled on major plot points from Shades, including the ending. So, if you hate spoilers, don’t read this before you read SHADES OF WICKED. Seriously, I cannot stress that enough. That aside, here’s my standard disclaimer about all pre-published excerpts: it hasn’t been revised or copyedited, so you will probably find spelling errors, grammar errors, and missing/incorrect words. It also might change from the final, published version for all the same reasons. I hope you enjoyed this excerpt! 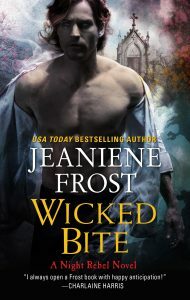 You can pre-order WICKED BITE at: Amazon, Apple Books, B&N, BooksAMillion, Kobo, IndieBound or your favorite book store. Do we know when audible pre-order will be available? Thanks Jeaniene! Will you be signing books again for this one? I planned to wait until that announcement to pre-order. I’m even more excited about this book release! So excited. Love what I read so far. Can’t wait for the summer!!! Can’t wait for it to come out!!!! Loved the first book!! Awesome!!! Please post when the audiobook will be available so I can order it as well! Best Valentine’s gift ever!!!! Thank you for the sneak peek!!! I’m waiting anxiously until the whole book published!!! I’m so in love with this series ! This may be irrelevant now since the book is being moved to 2020 and will be heavily edited, but in the snippet Leah says, “It’s so new, there are only essence imprints from four people on it” (Bones, Cat, Veritas, and Veritas’ father). However, shouldn’t it be essence from five people/beings? In “Shades of Wicked” there was a part after Veritas’ father brought Ian back where Silver put his paw over Ian’s head to protect him (and then Ian tried to eat him). I could not believe that fifty, (yes I said 50) years of serving off ALL romance books, I am an avid lover of the entire Jeaniene Frost line and ESPECIALLY the books of IAN’s and Veritas!!! Thanks SO MUCH for the Preview!!! I have also done a per-order through Amazon so that whenever it is ready -I will get it!! !